The event billed on social media as a "Patriotic Unity Mega Festival" in front of Calgary’s city hall on Sunday was met by an opposing group rallying against what they saw as a message of intolerance. 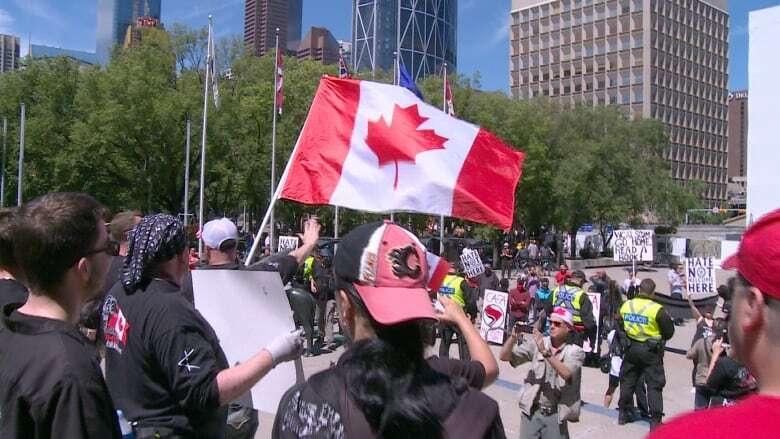 The event billed on social media as a "Patriotic Unity Mega Festival" in front of Calgary's city hall on Sunday was met by an opposing group rallying against what they saw as a message of intolerance. Gathered on one side of the municipal plaza were members of the Worldwide Coalition Against Islam (WCAI), which was denied a special event permit for the rally by the city. Officials said in a written response to the group the decision was "on the basis that your organization, and messages it espouses, are hateful." Across the plaza were members of Calgary Anti-Fascist Action (AFA), who say they wanted to show unity against what they called messages of intolerance and hate. Standing between the two groups were Calgary police officers, ensuring things remained peaceful. Insults, slurs and chants were hurled back and forth. However, no arrests were made. Among the few dozen people watching the two sides rally was Lifetime Adventure Travel guide Judi Sommerville, who was leading a two-hour tour of the downtown. "It's totally embarrassing," she said. "And it does not represent our city in the least. This is where we start the tour and talk about city hall and some artifacts, and it's not a very good way to begin a tour of our beautiful, interesting city." Sunday's rallies culminated three days of protests and counter-protests in the city. On Friday, about 100 people chanted and listened to speeches to mark the annual International Day of al-Quds. Nearby, about 50 pro-Israel demonstrators chanted, sang and danced. A heavy police presence also kept those two groups apart. Then on Saturday, an event called We Stand United in One Love Canada was held as a protest against the WCAI event, which was originally planned for Saturday. Later in the day, another rally organized by Calgary Anti-Oppression Network was held, also in opposition to the WCAI event.